Figure 8.5. 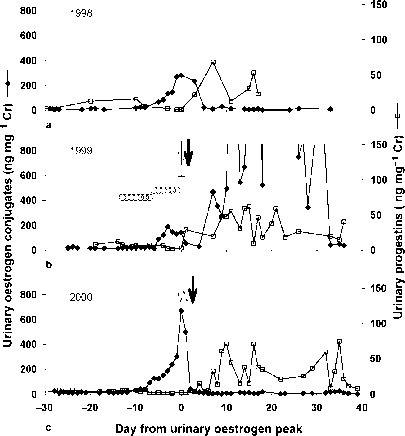 Faecal and urinary steroid measures in female SB 473: (a) faecal (o) and urinary (♦) oestrogen excretion; and (b) faecal (*) and urinary (□) progestins. Values were aligned to day of urinary oestrogen peak (Day 0). on Days —9 to —7 and exhibited tail-up behaviour on the last day of FSH treatment. There was a brief mating the next day followed by three days of receptive behaviours (tail-up and lordosis); however, the female showed little interest in any male, and no birth resulted. Figure 8.6. Daily urinary oestrogens (♦) and progestins (□) in female SB 414: (a) 1998, a 'control' natural oestrus; (b) 1999, exogenous gonadotrophins, mating and AI; and (c) 2000, natural oestrus, mating and AI. Values were aligned to day of peak oestrogen (Day 0), except for 1999, when values were aligned to the day of mating (Day 0). !, mating; ! (bold), AI; o, FSH; +, hCG. (~22 ng mg—1 Cr) during the remainder of the sampling period. 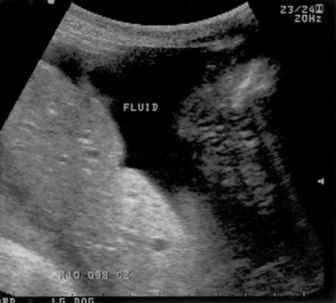 The female bleated on Day —8 and exhibited tail-up and lordotic postures on Day —1. After naturally mating twice (Day 0, Day +1), AI was performed on Day +4, progestins increased by Day +8, and a healthy cub was delivered 121 days post-first copulation.